Performers include: Vicki Lawrence, Ken Berry, Dorothy Lyman, Allan Kayser, Beverly Archer, Eric Brown, Karin Argoud, Rue McClanahan, and Betty White. A spin-off of a popular skit from The Carol Burnett Show, this sitcom tells the story of outspoken grandmother Thelma “Mama” Harper (Vicki Lawrence) and her family and friends in the southern community of Raytown. Widow Thelma lives alone with her spinster sister Fran (Rue McClanahan) until her recently abandoned son Vinton (Ken Berry) and his teenage children Sonja (Karin Argoud) and Buzz (Eric Brown) move in. Vinton is soonafter reunited with his high school crush Naomi (Dorothy Lyman) who lives next door. They marry and move to Arizona but soon return as the victims of a scam and are forced to move into Mama’s basement. Mama’s other children also stopped by to wreak havoc like favorite daughter Ellen Jackson (Betty White) and crass daughter Eunice Higgens (Carol Burnett) with her ignorant husband Ed (Harvey Korman). 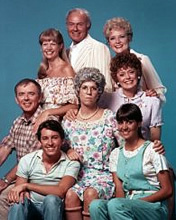 Sonja, Buzz and Fran leave after one season and were replaced by Eunice’s dim-witted son Bubba (Allan Kayser) and prissy neighbor Iola Boyland (Beverly Archer). Time life sells the entire series in DVD! It’s still one of the best! Side note: Sonja, Buzz, and Fran left after 2 seasons; and it’s Iola Boylan, not Boyland. PUT MAMAS FAMILY BACK ON TV LAND BETWEEN 8-9 PM EVERY NIGHT!! !